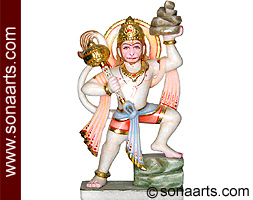 This stone statue of hanuman gives the feel of immense strength that Lord Hanuman has. This statue shows him carrying a mountain in one hand and his Gadda in the other hand. Carved from high quality marble, this marble Hanuman statue comes in attractive colors used to highlight his attire and ornaments.